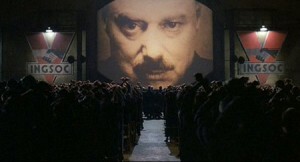 Adam Sutler is the out of control paranoid and aggressive psycho-dictator from the depths of a political nightmare. His rabid and desperate squeeze for absolute control of every aspect of the citizens’ lives and minds leads him into ever more extreme measures to the point at which something has to give. He provides thought provoking reminder to examine the words and deeds of our own world leaders, and to consider what drives them and where they ultimately may take us. 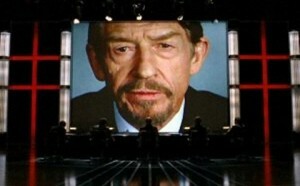 This role brings John Hurt face to face with his role in the George Orwell classic: 1984. In V For Vendetta he plays the overlord tyrant, who appears almost identical to the ruler in 1984 where Hurt played the downtrodden citizen, Winston Smith, found guilty of ‘thought crime’. Sutler: I want this country to realize that we stand on the edge of oblivion. I want everyone to remember why they need us! Sutler: My fellow Englishmen: tonight our country, that which we stand for, and all we hold dear, faces a grave and terrible threat. This violent and unparalleled assault on our security will not go undefended… or unpunished. Our enemy is an insidious one, seeking to divide us and destroy the very foundation of our great nation. Tonight, we must remain steadfast. We must remain determined. But most of all, we must remain united. Those caught tonight in violation of curfew will be considered in league with our enemy and prosecuted as a terrorist without leniency or exception. 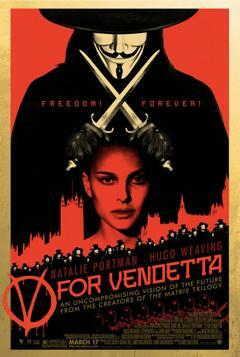 Tonight, I give you my most solemn vow: that justice will be swift, it will be righteous, and it will be without mercy.